Hello everyone! This newsletter has a short video showing some of the features we’ve coded for the combat Alpha test that is about to begin. We’ve been conducting dev-only Alpha runs, and we’ve realized that it would be easier to show some of the features we’ve built recently in a special video, than to ask our supporters to try to figure them all out from normal combat footage. In this video, you’ll see that Meltdown is invulnerable, and can kill enemies in one hit. That’s not the usual situation, but it is useful for showing off the new features. In the video, you can see the colors currently being used for enemy level identification, from light green for two levels below the player to purple for 4+ levels above the player. We expect to make changes to these features based on feedback from the Alpha, but this is the current state of the game. Enemies are color coded to show their level relative to any player. Also, we’ve implemented a collection of UI improvements. Meltdown now has two power trays, and the player can choose how many powertrays to have. While we don’t show off every option in the video, each powertray is now individually moveable to anywhere on the screen and lockable, and can be vertical or horizontal. Many UI elements can be reduced in size; full size is shown in the video. Also, in response to some requests from the Ship of Heroes forums, players can now invert the X- or Y- axis of their mouse. The area you see in the video is the starting location for the upcoming combat Alpha runs. This spot is in the Science Park area of Apotheosis city. 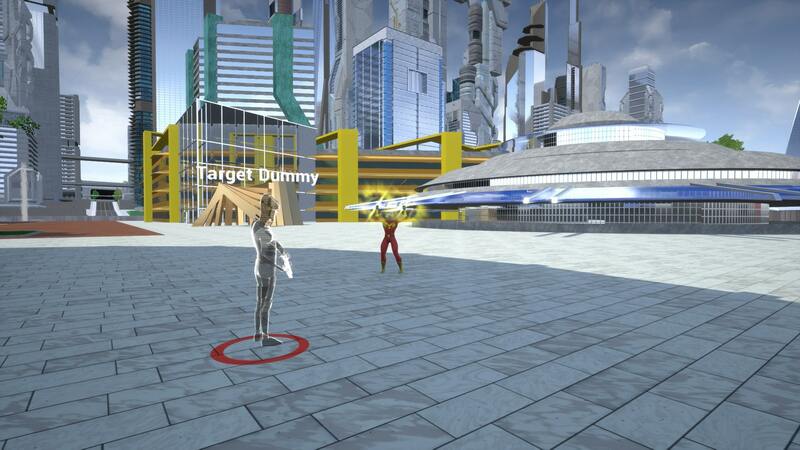 It is the respawn point for defeated heroes in the Alpha, although we have coded an in-combat resurrection power. You can see the icon for rez in slot number 11 of Meltdown’s lower powertray (above). The escorted Alpha tours will take place in the Science Park area. We’ve upgraded the tab-targeting system to not only take into account the closest enemy, but to also give preference to enemies that are in front of the character, using a forward cone of vision. In addition to manual targeting by the player, the game also auto-targets your next enemy when you have several close to you. The auto-targeting shifts a player’s target to the next enemy, but does not rotate the character until the player attacks that enemy. 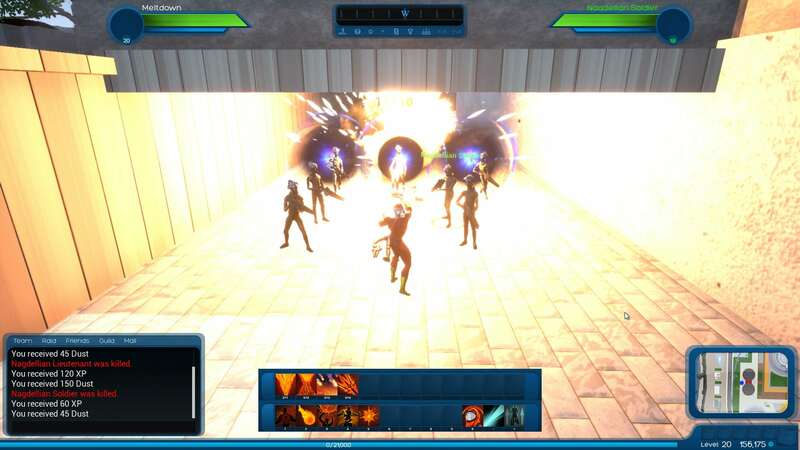 A player can tab-target at any time and select a new enemy, or simply click and launch an attack. You can see these features in a controlled situation with target dummies, and then in a larger mob situation – good thing Meltdown is still invulnerable! Auto-targeting is especially important when fighting a whole mob of enemies. We’re going to be showing a small set of team-based fights as our escorted Alpha begins in the next week or so. Again, we wanted to share a few of these improvements in advance, so that the community can clearly see what we’re doing. As always, nothing is set in stone. We’re happy to make changes based on the discussions in our forums. This is a short technical features video designed to make it easier for our community to give us feedback on the upcoming combat Alpha video and livestream. We will be recording the Alpha in a packaged version of the game, as we usually do. 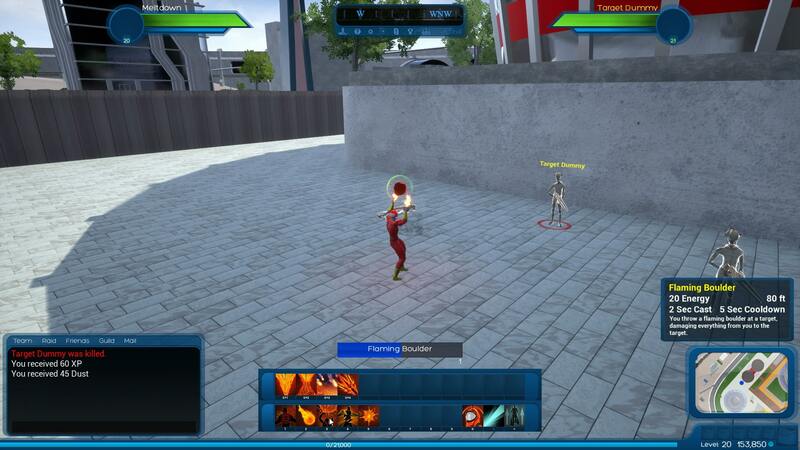 We have added a wide variety of features to SoH in order to facilitate combat. Many of these were taken from requests of suggestions on our forums. Power trays can be added, can be vertical or horizontal, are moveable over the screen, and are lockable. In addition, most of the UI is resizable. Game volume is now adjustable in the settings. Enemy colors now show the difference between the enemy’s level and your character’s level. Intelligent tab-targeting now accounts for both proximity, and which direction your character is looking. Auto-targeting in combat is enhanced, as is retargeting once an enemy is defeated. Auto-rotation to face a new target now occurs only on power use, and is slowed down to prevent motion sickness. Combat against groups of enemies is now smoother. Meltdown automatically retargets the next enemy. 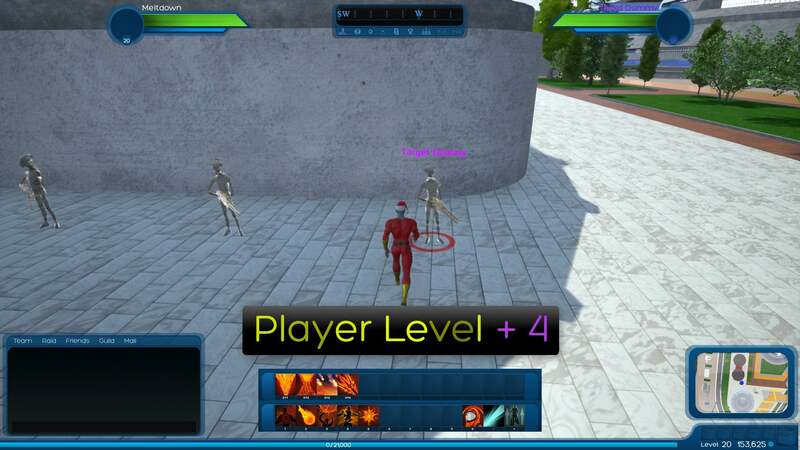 UI upgrades are shown. The next major event on our milestone schedule for 2018 is to upgrade from 4.16, our current Unreal Engine version, to 4.17 and then 4.18. That will allow us to continue integrating the engine improvements Epic Games builds. After that, we will likely begin planning a closed raid test using a mix of supporters and devs.